In the past, when sewer lines were damaged or worn out over time, pipe specialists would have to dig up and repair each section of piping that needed attention. Repairing pipes this way was not only costly and labour-intensive, but it is also destructive to the surrounding landscape. Now, thanks to modern pipeline trenchless technologies, you can take a cost-effective and sustainable approach to reinstate your old pipelines back to full usability. The term ‘trenchless technology’ refers to a family of underground piping installation methods which causes minimal disruption or disturbance to road traffic, lawns and gardens, business operations and other activities. 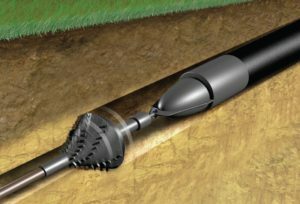 Although there are several kinds of trenchless methods, three processes are the most common: horizontal directional drilling (HDD), pipe lining and pipe bursting. The HDD process is typically used for water and gas pipe installations in soft ground. Once you create a pilot hole, you can use a mechanical cutter or a fluid jet to ream the hole and pull out the existing pipe product. A slurry is then used to stabilise the borehole and reduce friction during the removal of the pipe. The new HDPE Pipe is pulled through the hole, and joined at the pilot hole, or directed into an access pit. The pipe lining process involves pulling or inverting a new HDPE liner into an old concrete or steel pipe. The HDPE pipe is stretched or folded to allow it to easily enter the existing pipeline. Afterwards, technicians apply either pressure or heat (or both) through the pipeline, forcing the liner to expand and tightly fit the pipe perimeter. Although this method slightly reduces the internal diameter of the pipeline, it allows the pipeline to be re-pressurised without completely pulling out the old pipes. The pipe bursting method is commonly used in urban spaces where the pipework is directly below paved surfaces. With pipe bursting, technicians use a steel head to fracture a pipe from the inside and displace the fragments, forcing those outwards. This enables a new HDPE pipe of the same diameter to be drawn through to replace the old pipes. This method is quick and efficient, but carries a risk of pipe gouging from the fragments. Using HSCR Pipe can reduce the risk of gouging and pipe failure, as HSCR material has many times greater stress crack resistance than standard PE100 resin. Traditional digging processes take substantially longer than other pipe installing or repair methods. Trenching across roads means the work must be done at night, to reduce traffic disruption. With trenchless installations and repairs, you speed up the process for addressing damaged pipelines, allowing tunnelling under roads even during heavy traffic. Because there is no need to hire a big team of technicians, traffic management people, excavators, landscapers, and so on, trenchless technology is often the most cost-efficient option. Trenchless methods also minimise equipment and tooling requirements and reduce your expenses for labour. Since there is very little digging involved in trenchless technology, you create minimal damage to the surrounding landscape. Trenchless installations also don’t require structural modifications, such as wall demolitions or pavement renovations, letting you work on installing piping infrastructure with as little trouble as possible. HDPE pipes provide greater flexibility, damage resistance and leakage prevention than ordinary PVC, steel or concrete pipes. Using HDPE pipes with trenchless technology gives you pipework with unmatched durability. Acu-Tech Piping Systems is a private company based in Maddington, Australia. The key to our success lies in our commitment to providing the highest quality service and support to various industries. The sales team of Acu-Tech has extensive experience in water pipeline installations, guiding you in finding the best system that matches your requirements. Ensure the quality of your pipework and invest in an HDPE pressure piping system. Get in touch with us today. Disclaimer: As always with information supplied by Acu-Tech Piping Systems, we supply it as a guide in the interest of better understanding of the technical properties of our products. However, the application of such information may involve engineering judgements which cannot be correctly made without intimate knowledge of all the conditions pertaining to a specific installation. Acu-Tech Piping Systems does not act as a consultant in this regard; the responsibility for the use of any information or advice contained herein rests solely with the user. It should not be used in place of a professional engineer’s judgement or advice and it is not intended as installation instructions. See full disclaimer at: www.acu-tech.com.au/privacy-policy/.